Another part of our business is to provide professional yacht crew for motoryachts depending on the size and the power yachts for sale quality of the vessel. Hundreds of power yachts for sale are available in our portfolioin Turkey. We are always ready, willing and able to serve you with utmost attention and care! if you are considering to buy a second-hand or preowned power yacht for sale, then we highly recommend that you carry out a preliminary survey for the power yacht that you are considering in order to avoid making wrong desicions. this should be done before making an offer and to proceed with the yacht owner. it is utmost importance if the propeller and the shafts and brackets are in good shape? if the electric cabling and the systems set up correctly?, the electric, hydraulic, mechanic systems are in good working conditions ? depending on the motor yacht that you are going to buy a pre-owned power yachts for sale. 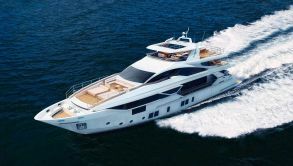 we can help you locate and buy the best power yacht that suits your budget and applies to your needs. Our portfolio is the summary of thirty-years of experience at sea. You can have a look at our yachts for sale portfolio where you can go through from the largest and most luxurious motor yachts to smallest motor yachts.